I spent the afternoon at my Mom and Dad's house earlier this week. While there, we were talking about our family plans for the Fourth, and my Mom said she had looked on the blog for a tablescape but couldn't find one. I realized I've never done one for the Fourth of July! So, even though we'll be celebrating at their house that day, I decided to to pull something together for my family to enjoy here over the weekend. I've had a red plaid tablecloth for years, and it does triple duty for Christmas, Valentine's Day, and now the Fourth! It's a good staple piece to mix and match with other colors according to the season. It was a no-brainer to include some blue and white accessories. My crepe myrtle needed a trim and the blooms are white, so yay for free greenery! 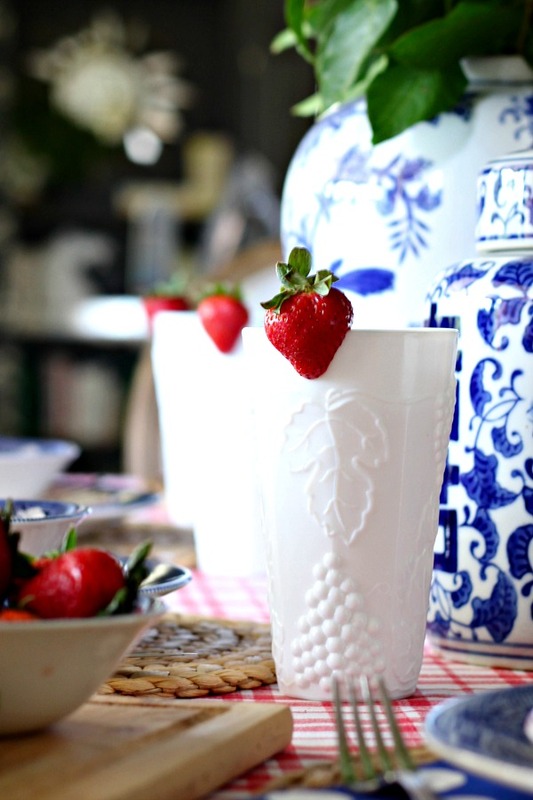 I've had some red toile dishes for years, and stacked with Blue Willow they feel mighty patriotic. When I shared some fun red, white, and blue tabletop accessories from Target with you last week, I mixed in some natural wood pieces to add some texture and break up the strict red, white and blue color scheme. 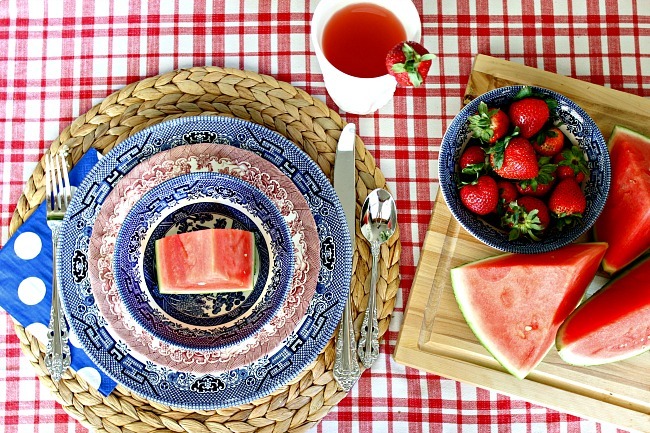 I followed suit in my own tablescape with the woven placemats and wood cutting board to serve fruit. I picked this vintage Avon cologne bottle up from a yard sale a few months ago. 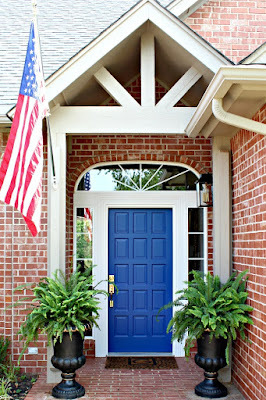 I couldn't resist it's charm and knew I would enjoy displaying it for patriotic holidays. White milkglass works with so many seasons, too! Strawberry Lemonade coordinates with the color scheme, and a fresh strawberry on the rim ups the cuteness factor. The only thing I purchased for this table were the polka dot paper napkins. I like the whimsy they add mixed with the plaid and pattern on the dishes. This was a super simple table to put together. I even saw some cute blue and white gingham paper plates along with a red design in the Target ad this week if you want to go the paper route (I know we will be on Monday!) that would be darling stacked together in an alternating pattern. It doesn't take much effort to pull together a festive table. In fact, this is probably the easiest holiday to decorate for. I hope you'll try a fun combo this weekend! *Some affiliate links used for your shopping convenience. I may earn a small commission through these links at no extra cost to you. Thanks for supporting Dimples and Tangles to keep great content coming! 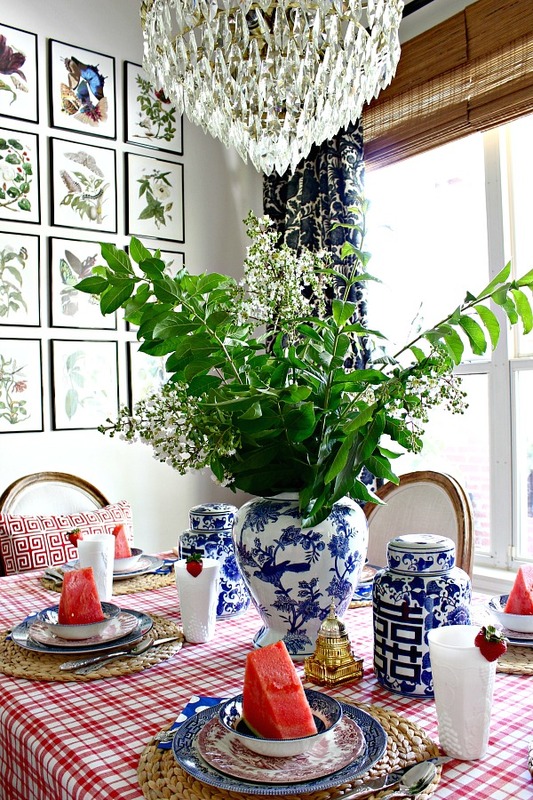 I love that your mom looks on your blog for holiday tablescapes. You are the go-to expert on the subject my friend! 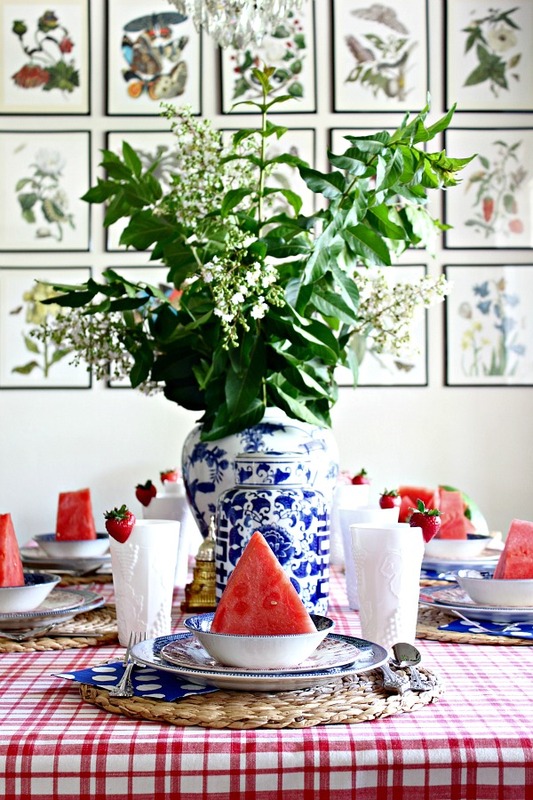 This one is so pretty, love the watermelon placed at each setting and the mix of patterns, so festive!! So simple and yet so pretty! I'm with Lisa - love that mom checks your blog for table ideas - so sweet! Have a great weekend! wow! this is stunning! and i really want some watermelon now. I so admire your ability to mix patterns and colors. 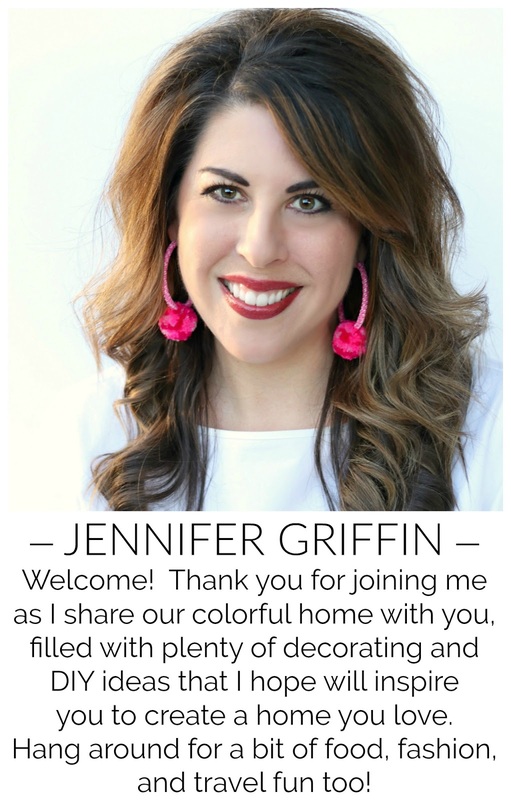 I tend to stick to neutrals and "quiet" tones, and this reminds me that sometimes it's good to create energy around events! 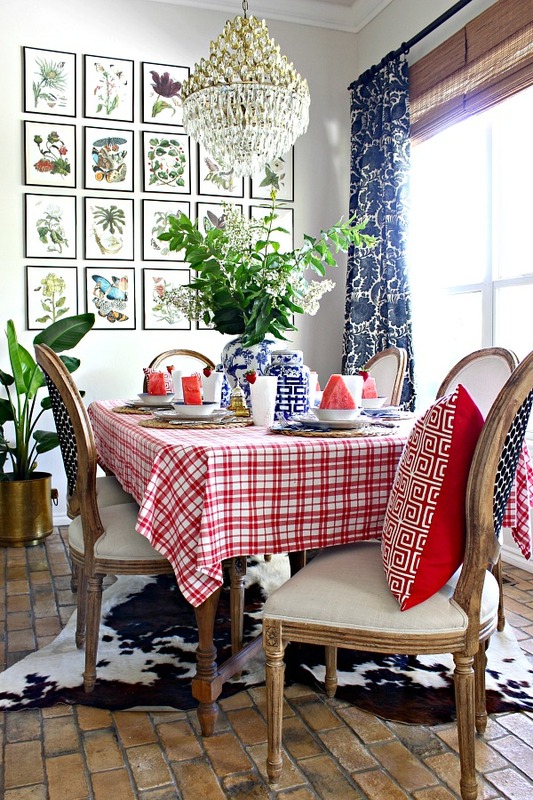 A shot of red, a wide stripe, giant polka dots, easy enough to add. Thanks for the inspiration, and Happy 4th! Boom! You nailed it! 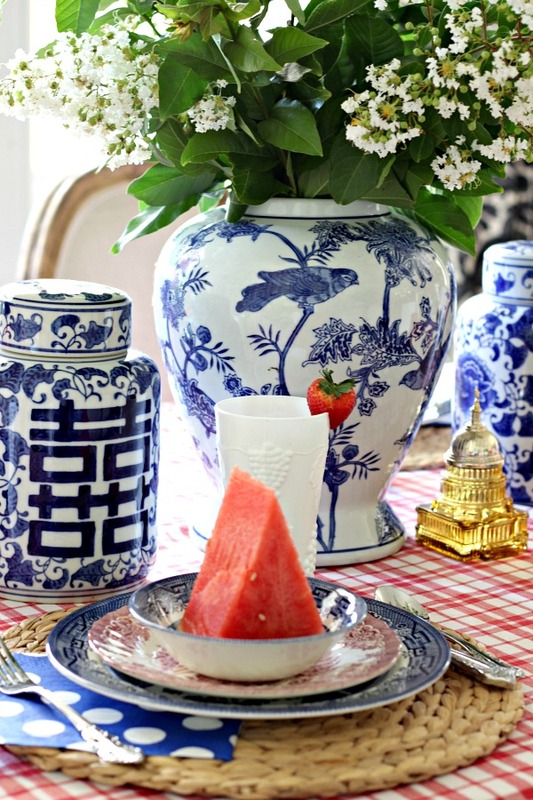 That is a delightful, charming, and patriotic tablescape that doesn't feel like you draped it in the stars and stripes. I love the way you put together patterns and colors (always) and this is another stunning example of your talent. Happy 4th of July! Thank you for the gorgeous eye candy! Its beautiful!!! Of course I love the ginger jars. Your incorporation of watermelon and the reds is done so beautifully. Love this tablescape, I is totally making my Friday, High Five! 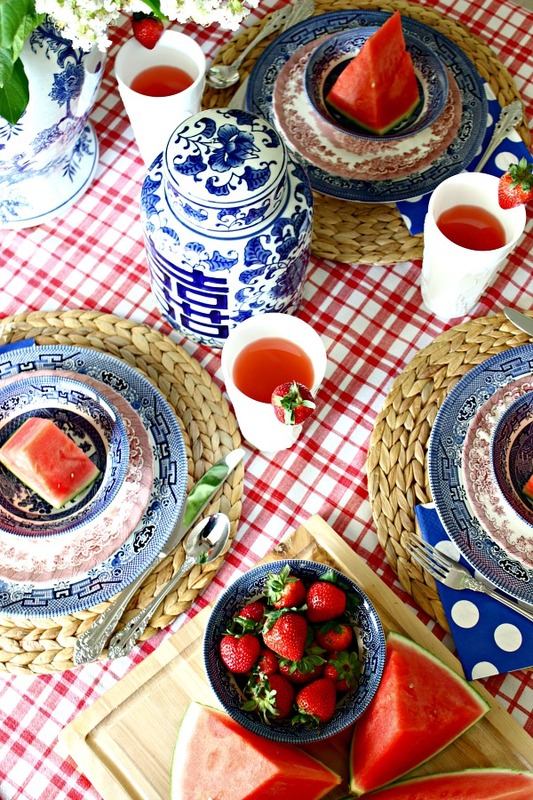 The multi colored transferware looks so good together and perfect for 4th of July. 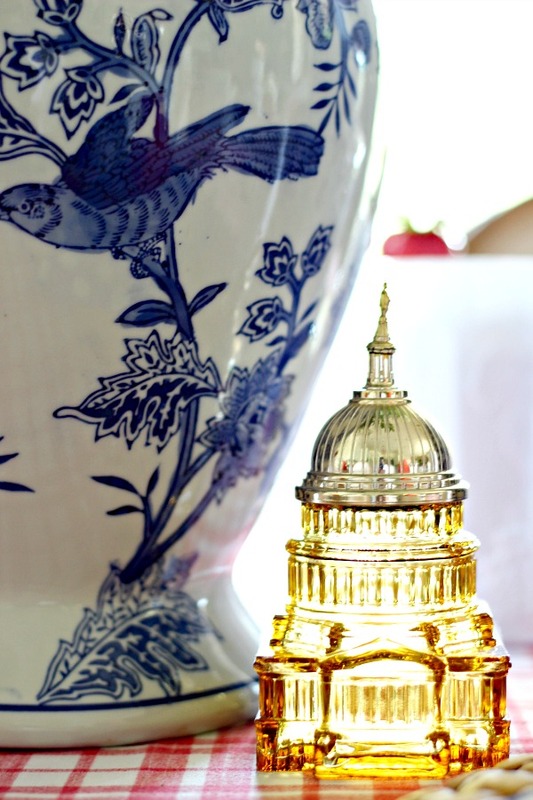 love it, of course I had to buy an Avon capitol bottle, too cute. your gallery wall is spectacular.